to protect their trade secrets and other confidential information. As an employee, there is a chance you will be asked to sign an NDA for various reasons, including when you’ve been hired to a new position. This legally enforceable contract establishes a confidential relationship between the person signing the document and the person or organization creating it. 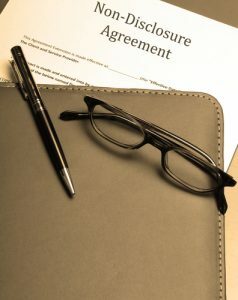 If you are asked to sign one of these agreements, it’s likely because the company or individual has no way to decide if you can be trusted to keep confidential information secret. Asking you to sign an NDA is not personal—it is merely a way to establish confidentiality. Before you decide to sign an NDA, you should understand all its terms and conditions. An NDA typically includes definitions of all information considered confidential, obligations from all parties involved in the agreement and the period during which the agreement remains in effect. What information is considered confidential under the agreement? The agreement should clearly spell out the categories and classes of information covered. It will not include the precise information to be covered, but should give you a good overview of the types of information you must keep confidential. How long does the agreement prohibit me from mentioning this information? This is important to consider. NDAs might require you to keep information secret for years after your employment comes to an end. If you leave or lose your job and wish to find employment somewhere else in the same industry, you may still be covered by the terms of your NDA. This could limit your ability to take a position with a competing business or organization. What constitutes a breach of the contract? NDAs explicitly state that the person who is to receive the confidential information must keep it secret. That person is not allowed to breach the contract, encourage others to breach it or even allow access to that confidential information through any method. For example, even accidentally leaving behind a flash drive with your company’s intellectual property on it when you leave a coffee shop could be considered a potential breach of contract, especially if someone else accesses that information. Make sure the breach of contract rules are detailed clearly. For further legal advice on nondisclosure agreements and other employment contracts, speak with a skilled New York wage and labor law attorney at Cilenti & Cooper, PLLC.